Battery Fires: Why They Happen and How They Happen was written to assist those interested in this type of incident understand how automotive fires develop, spread and the damage they cause, using both deductive and inductive reasoning. The main focus of the book resides in looking at differences in failure modes between DC and AC systems, general types of battery and electrical failure modes leading to fire, how to interpret electrical fire, determination of the primary failed part, and other skills the investigating engineer will require to perform technical failure mode analysis. However, some fires have consumed the evidence to the point where a determination cannot be made with any degree of certainty. In this instance, evidence will be quite limited, and the analysis will have its limitations and should be included in the discussion as such. In some cases, a “cause undetermined” report is all the evidence will support. Battery Fires: Why They Happen and How They Happen is a unique title which brings together the theory and the practice of correctly evaluating the root causes of unexpected and dangerous automobile fires. 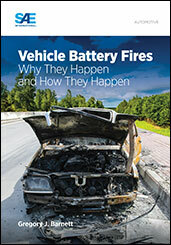 If you do not have access to SAE MOBILUS via username/password or institutional access, you can still purchase the Book, Vehicle Battery Fires: Why They Happen and How They Happen.